The title "God of Light" has been used to in a number of cultures and religious traditions to describe a number of Spiritual and mythologcial beings. It is unknown whether the Cosmic Being who spoke to the Earth on April 22, 1948 was any of these. Among those who have had the appellation "God of Light" applied to them were Mithras, Balder, Apollo, Hyperion, Ra, Horus, and Ahura-Mazda.
" . . . Do you realize the Great Effort the Cosmic Beings have made to enable you to have this Material at this time; and to bring about the Momentum which is yours at the present hour through your Decrees? The rest of mankind does not have It! You are but a handful compared to the masses! Even with that handful, if you understand Me tonight and will dare to use the Power I offer, you can make the Calls the Cosmic Law requires! You shall find My Words, 'THE COSMIC LIGHT OF THE VICTORIOUS CHRIST', an Invincible Scepter of Power! They are the Authority which will compel the change of manifestation in the physical octave, that none can oppose! I think That is worth-while! "The Mastery of Life is held within the Cosmic Christ, which is the "Mighty I AM Presence" from the Great Central Sun! Try to think deeply, and lovingly, and intensely upon the importance of all those words - the 'MIGHTY I AM PRESENCE' - mean to Life! There is no phrase anywhere which releases exactly the same action as that phrase and group of words! They contain a Power like nought else! Believe Me, my loved ones, tonight, for I love you beyond anything you can understand! 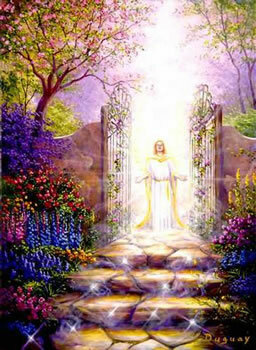 Each of you is an Open Door, through which the Gifts which the Mighty Godfre gave, opened the door for you to receive! May They come through you to the nation you love; and with Our Assistance to all life throughout the world! "You are not subject to the mistakes of others! You are not subject, even, to the reaction of your own mistakes! When your Forgiveness is Complete and your attention, with this Determination, goes to That 'Presence', YOU CAN COMMAND IT TO ABIDE AND IT WILL STAY THERE! . . . "
". . . You can have just as Much Light as I can have; because there is no limit to the Light of the Victorious Christ; and what is the Victorious Christ in Cosmic Action? What is It? It is the Full Commanding Presence of the 'Mighty I AM' of the Cosmic Beings Who govern this System of Worlds - not only this System, but All Systems from the Central Sun! Is there at any time, anything that is not Victorious, when the Beings of the Central Sun command Manifestation? Is there any such thing as failure to Them? Then when I say to you: 'CALL FORTH THE COSMIC LIGHT OF THE VICTORIOUS CHRIST, BY THE FIERY HAND OF THE 'MIGHTY I AM PRESENCE' OF ALL BEINGS IN THE GREAT CENTRAL SUN; AND THE COSMIC BEINGS WHO DIRECT THE DESTINY OF THE PEOPLE OF THIS WORLD' - you will understand something of the Realm in which We continuously abide! . . . "
". . . With all the teeming millions on the Earth you are but a handful, true; and yet, you do have Conscious Understanding of how to command and Call These Our Powers into the physical octave of Earth! Therefore, We love you deeply; and are determined to give you Your Freedom! Oh, don't accept this appearance world! You could become dynamically positive in My Radiation FOR ONE HOUR; AND CHANGE THE DESTINY OF YOUR CITY OR THE NATION! "Beloved of the Light, I say to you: remember My Phrases tonight: THROUGH THE 'BELOVED MIGHTY I AM PRESENCE WHICH I AM'! I CALL THE INVINCIBLE FIERY HAND OF GOD, TO BLAZE THE COSMIC LIGHT OF THE COSMIC CHRIST INTO EVERYTHING THAT CASTS A SHADOW; AND COMPEL THE VICTORY OF THE LIGHT TO POSSESS IT, AND FOREVER HOLD COMMAND! "Beloved Ones, you've spent plenty of energy in the past being just as positively dynamic as "I AM" tonight through the Messenger! You can be just as dynamically positive in the Command for Harmony, Love and Perfection in the Victorious Christ; to blaze the Cosmic Light that will compel Peace. If you don't compel Peace, you will live under war! . . . "
" . . . My Loved Ones, your own Light must be enfolded, protected, and expanded by Cosmic Action! We are the Authority and the Directors of the Cosmic Light, to bring That Action into the physical world! You can be just as much of the Victory of the Cosmic Christ as you desire! Why do I say the Cosmic Christ; because That is Our Cosmic Power of Victory none of mankind's human creation can ever change! If you don't stand for Our Victory, then you will be the failure of the human. "If I were you, I would plead with mankind, to stop defiance against the Obedience required by Life to give you Its Greatest Blessing. We want to bring you Happiness! We want to bring you Miracles, Manifestations, and Blessings from Our Great Realms of Life; which will help you set the Pattern of the Permanent Golden Age to the World! F or everything you call forth in the outer world, It would become the Greatest Joy, and Greater than all mankind has ever known! "We have Divine Gifts to give! None can convey nor bestow Them but Ourselves! THEY COME FROM WITHIN THE COSMIC LIGHT OF THE COSMIC VICTORIOUS CHRIST! Don't forget That Word, and don't let anybody make you forget to place your 'Mighty I AM Presence first! "Take Me at My Word tonight! Take your stand that no longer shall anybody or anything on the Earth dishonor God! I will show you Legions of the Ascended Master Friends of the Victorious Christ; Who shall bring Manifestations to abide on the Earth for Eternity. Why did the Prophets of Old have the Manifestations They did? Because They stood INFLEXIBLE before mankind with the Demand for the Manifestations which awakened those to whom They came; and so can It be for you. May I fire you tonight with the Acceptance of the Reality of My Presence; so you may have God's Victory of the Cosmic Christ in physical action wherever you need to be! OH, THE HAND OF GOD HAS NOT LOST ITS POWER! THE HAND OF GOD HAS NOT LOST ITS POWER TO GIVE THE BLESSING OF GOD'S WEALTH! . . . "
". . . You may have the Assistance in the physical octave to bring the Victory of the Cosmic Christ; and the Full Reality of That Presence - the 'Beloved Mighty I AM' - into all your outer affairs; and mankind will be compelled to understand. It seems to Me the people have dwelt long enough in the shadows of their own deliberate defiance of the Happiness and Perfection of God's Plan Fulfilled! It seems to Me Strong, Gigantic Dispensations can be given to you, to awaken the masses from the degradation of their own choice; if you will understand, My Loved Ones, and be honest with yourselves! Take this Attitude; if there are problems within your world, they are but the return to you of your own defiance of the past, of God's Request for Obedience, to the Cosmic Light and Its Divine Plan of Perfection. "The hour you take That Stand, with every problem which comes to you for Solution, and you say: 'Well, this is my defiance of My God in the past! I AM through! I AM THE OBEDIENCE OF THE VICTORIOUS CHRIST- THE FIERY HAND OF THE MIGHTY I AM PRESENCE IN THE PHYSICAL OCTAVE! I move forward, obey, and produce the Perfection God demands, to fulfill the Divine Plan!' and you won't have another problem nor limitation! My Dear Ones, when you are so determined to have your own way, stop a moment and ask yourselves; if that is the Victory of the Cosmic Christ! Some of Us will be blazing to you, when you recognize That Phrase, the Illumination which will tell you the Truth. "My Loved Ones, there is another thing I wish to call to your attention! If you will say: 'THROUGH THE BELOVED I AM PRESENCE, THE INVINCIBLE FIERY HAND OF GOD MOVES INTO OUTER PHYSICAL ACTION, AND DOES PRODUCE MANIFESTATIONS OF THE INVINCIBLE HONOR FLAME OF GOD'S HEART!' I shall not need to tell you more! "I must bid you adieu. The Power is Tremendous! I think you have had quite all you can stand for tonight; but It shall not bring you strain, nor distress, nor problems! It shall be for you the Solution of every problem. If My Gift to you, and the Protection I want you to have, reveal to you some of My Love; then I can show you Greater Realms and Greater Victory of the Cosmic Christ; which you may have to bless your nation and your fellow man! Live for Its Cosmic Divine Plan Fulfilled; and you shall be a Part of the Happiness you have always craved and never attained! "This night, My Love is your Guardian! My Light is yours to command - to concentrate into action; to compel the annihilation of all shadows, be they your own, or your fellow man's! Unless We have some group of mankind who will use this Cosmic Authority with Conscious Understanding, the wheels of Cause and Effect grind forever through physical experience, the mankind of Earth; until the people cease their defiance of God's Perfection! There must come the Acknowledgment of the God-Authority which sets all Free! Human creation is not Authority over God! Human creation is not the Authority over any Life Stream! Two- thirds of every Life Stream is Eternal Perfection! The little part of the Life Stream's energy, which is anchored within the physical form for the physical experiences of this world, is not the Master of Life! I would remind you of that often! "The day you take your Stand with your Beloved Mighty I AM Presence and the INVINCIBLE HAND OF GOD, to BLAZE THE COSMIC LIGHT OF THE VICTORIOUS CHRIST - your Experiences will be Proof of the Truth I tell you; and the Greater Light I give, will prove to you the Height of My Love! In the Victory of That Supreme Honor Flame of God's Cosmic Heart - the Victorious Cosmic Christ awaits your Call; to clothe you with Its Mantle of Mastery forever! You may just as well have It tonight as your human problems! You must make the choice! Having made It, you must be Inflexible and Loyal in your Stand for Its Manifestation in the outer; until God's Fiery Hand has swept aside the human veil; and you know Life's Perfection has come to stay forever! "Give Us this assistance, My Loved Ones, and prevent that which is not even describable in words! We have watched mankind a long, long while. I have watched through many centuries! I still watch; but I plead for Obedience in the outer selves of mankind! Oh, not that I may be Free, because I AM FREE! but that mankind's distress and degradation may cease; and all dishonor to Life may be removed from the Records of Life! "This night, with your assistance, there can come the Great Onrush at your Call! Ask your Mighty I AM Presence to BRING THE REMEMBRANCE OF MY WORDS TO YOUR OUTER INTELLECT; AND THE COSMIC ILLUMINATION OF THE COSMIC CHRIST, BRING TO YOUR MEMORY THE EXPLANATION OF WHAT IS REQUIRED; TO BRING AND HOLD YOUR VICTORY IN POSSESSION OF THE PHYSICAL WORLD! It shall manifest and produce for mankind that which sets people Free! "In the Great Enfolding Love of the Angelic Host; in the Great Patience and Forgiving Love of the Cosmic Beings, Whose Assistance to the Earth has been offered for centuries - I clothe you tonight; with the Realization of the Privilege and Power which are yours with Our Assistance; to bring into the physical octave That which helps your Nation; and prevents mankind focusing again the criminal destruction of war upon Life! "In all the Love at My Command, and Light so Blazing- when you enter into Its Heart- Eternal Power, Peace and Happiness are yours to produce Victory! Then you know Mastery abides alone within the Light of the Cosmic Christ! It is the Mighty I AM Presence's Great Gift from the Great Central Sun! Enter in and use Its Power without limit! Move forward your Invincible Victorious Command. "In the Peace that surpasseth the understanding of the mind, may the Elohim of Peace clothe you and hold you close in His Heart! I offer you all the Light I can Command for you to use, until shadows are no more! "The Great White Brotherhood in Its Authority and Cosmic Power; and the Assistance of the Angelic Host, the Lords of the Flame Who govern the Destiny of the Planet Earth - shall be your Daily Associates! My Words shall be fulfilled to you in physical manifestations. This night I call you into the Heart of this Great Victory for your Nation! May Its Power forever lead you onward, until you stand with Us, Eternally Free in Our Octave! . . ."